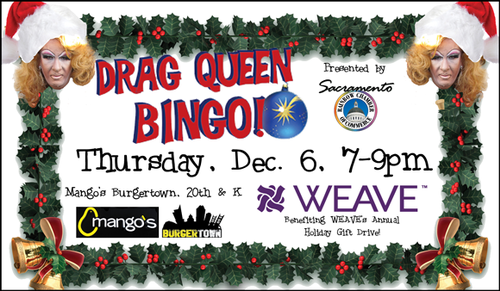 Join us at Mango's for Drag Queen Bingo, benefiting WEAVE's annual Toy & Gift Drive! Support WEAVE's Holiday Toy/Gift Shoppe! WEAVE requests gifts for children and adults of all genders. WEAVE always struggles to have enough gifts for teens and makes a special plea to our Drag Queen Bingo supporters to help fill this need. This can include clothing with area sports teams, hats (baseball hats, beanies, etc. ), leggings, socks, and hoodies. Art supplies, journals, and makeup are very popular. Small denomination (up to $10) gift cards for fast food are also a great option. If your heart is set on supporting a younger child, educational toys and games, dolls, cars, art projects, and pajamas are great. We ask that toys with guns or other weapons or otherwise depicting violence are not donated. Prizes for every Bingo game! Purchase your Bingo cards at the venue; we provide the daubers! Games start promptly at 7, but come early for a burger and to grab a seat--we sell out every month! Bingo Cards go on sale at 6:30 p.m. $15 for 8 games: Cash only at the venue, please.